Point Pleasant junior libero Peyton Jordan dives for a dig attempt during Game 2 of Thursday night’s volleyball match against the host Lady Generals in Winfield, W.Va.
Point Pleasant seniors Lanea Cochran (11) and Madison Hatfield, right, leap for a block attempt on a spike attempt by Winfield’s Skyler Cobb (14) during Game 1 of Thursday night’s volleyball match in Winfield, W.Va.
WINFIELD, W.Va. — As Kryptonic as the colors they wear. 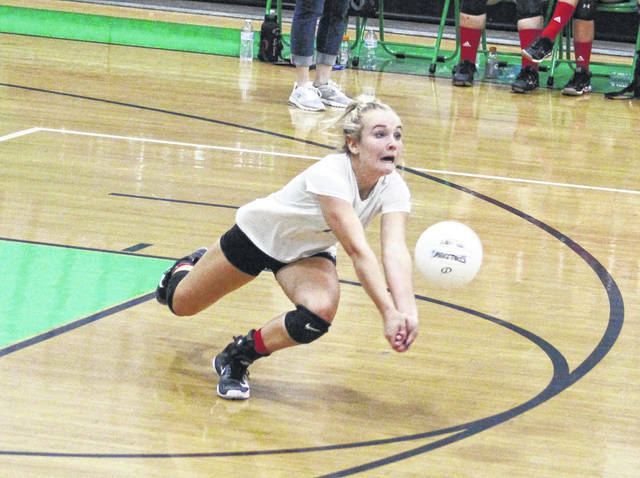 The Point Pleasant volleyball team had no trouble with the Blue and White of Princeton, but the Green and White of the Lady Generals once again proved to be too much on Thursday night during a tri-match split at Winfield High School in Putnam County. The Lady Knights (8-2) never trailed by more than three points in their opening match with the Lady Tigers, which ultimately led to a straight-game 25-20, 25-15 victory. The Red and Black, however, never led by more than two points in the opening game with WHS, then never led at all in Game 2 and ultimately dropped a 25-20, 25-19 decision. Point Pleasant — which suffered three of its four setbacks to Winfield a year ago — has now dropped 13 in a row to the Lady Generals, dating back to the 2008 campaign. It was also the 10th time that the Lady Knights lost in a straight-game fashion. By night’s end, PPHS coach Marla Cottrill was left with a little bit of a mixed bag feeling. The fourth-year mentor was proud of the way her troops handled business in the opening contest, but was left somewhat confused on what she has to do to get the Lady Knights over the wall known as the Lady Generals. “We’ve had a good little run in the matches we’ve played so far, and we feel that we’ve only been getting better because of the number of matches that we’ve played already,” Cottrill said. “Unfortunately, sometimes we play to the level of our opponents and sometimes we aren’t as strong in some areas on the court, but we also start two freshmen who are going through this for the first time at the varsity level. We hit the ball very well in the first match and we made a few too many mistakes against Winfield, but the more we keep playing — the better we are going to be. The Lady Knights secured a season-best seventh consecutive victory in the contest against Princeton, but the Blue and White stormed out to an early 5-2 cushion in the opening moments of Game 1. PPHS rallied with eight consecutive points to turn a three-point deficit into a 2-for-1 lead at 10-5, then gradually worked the lead out to as much as 21-12. The Lady Tigers answered with an 8-3 run to close to within four points at 24-20, but Point broke serve and took a 1-0 match lead with the five-point decision. Both teams were deadlocked in five ties through the first 10 points of Game 2, but the Red and Black countered by breaking away from a five-all contest with four consecutive points for what proved to be a permanent lead. Princeton closed to within three points at 9-6, but ultimately trailed by as many as 11 points on three separate occasions — the last of which came at 24-13. The Lady Tigers rallied for two straight points to close to within 24-15, but Point broke serve and secured the 2-0 match win with a 10-point triumph. 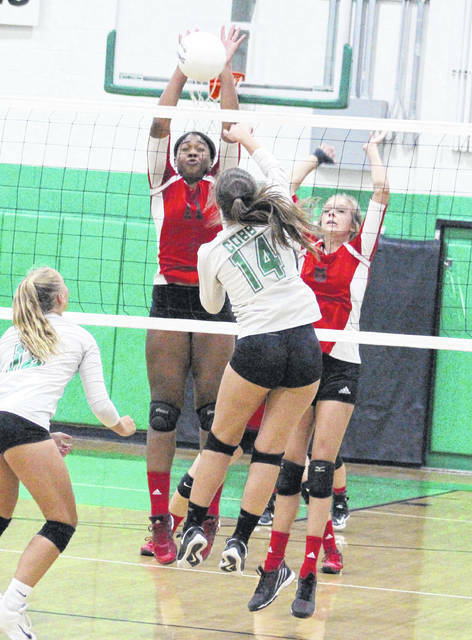 Lanea Cochran led the PPHS service attack with 12 points and six aces, followed by Peyton Jordan with nine points and Madison Hatfield with five points. Haley Milhoan and Olivia Dotson also added three points and one point, respectively, to the winning cause. Cochran and Tristan Wilson both paced the net attack with six kills and three blocks apiece, with Addy Cottrill adding two kills. 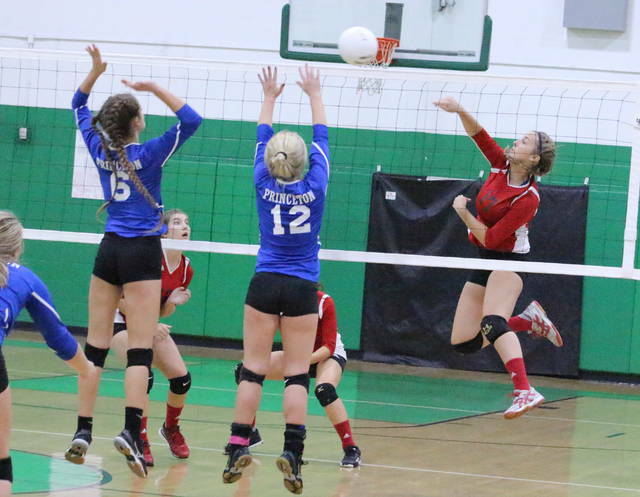 Milhoan and Hatfield chipped in a kill apiece, while Dotson also recorded a block against the Lady Tigers. Bailee Candler led PHS with six service points, while Samantha Ellison and Lauren Lefferty respectively chipped in five and four points in the setback. Point Pleasant opened up leads of 1-0, 2-1 and 3-2 in Game 1 with Winfield, but the hosts rallied with 13 of the next 18 points to take a 15-8 advantage. PPHS answered with a 10-1 run to reclaim the lead at 18-16, but the Green and White countered with a small 3-1 run that led to a 19-all tie. The Lady Generals reeled off the next four points and scored five of the final six points to wrap up the five-point win for a 1-0 match lead. The Lady Knights fell behind 5-0 and 7-1 at the start of Game 2 before clawing back to within 13-10. WHS, however, scored six of the next seven points and took its largest lead of the night at 19-11. Point scored eight of the final 14 points in the finale, but never came closer than 21-19 down the stretch. Winfield scored the final four points to wrap up the six-point win and the straight game decision. Dotson and Cochran led the Point Pleasant service attack with six points apiece, followed by Milhoan with three points and Cottrill with two points. Hatfield and Jordan also had one point each, with Milhoan, Cochran and Cottrill recording an ace apiece in the setback. Cochran led the net attack with six kills and three blocks, while Cottrill and Hatfield each added two kills and a block apiece. Milhoan also had a kill for the Lady Knights, with Wilson chipping in a block as well. Kendall Hill led Winfield with 10 service points and two aces, followed by Alyssa Artanas with nine points and Hollie Cunningham with six points. Emily Reed was next with four points, while Esten Clay and Jaedyn Ball respectively added two points and one point to the winning cause. Reed led the hosts with six kills and Lauren Hudson chipped in four kills. Ball was next with three kills and Skyler Cobb added another three kills. Cunningham also recorded one kill for the Lady Generals. Point Pleasant — which has yet to play at home this season — returns to road action on Monday when it travels to Cross Lanes Christian for a 6 p.m. contest.